It was the decade when the dreams of the '60s turned inside out and the yuppie emerged, along with home computers, E.T., and Madonna. It was a time of wealth and homelessness, when the drug culture raced toward oblivion and recovery became a crusade. Our ambitions in space were chilled by the tragedy of Challenger, and as the decade closed, Wall Street's money lords stumbled. The party was over. But the moments of triumph were bright: the building of the Vietnam Veterans Memorial, which seemed finally to heal an old wound in the nation's psyche; the discoveries made by Voyager; the warming of U.S.-Soviet relations; the tumbling of the Berlin Wall. 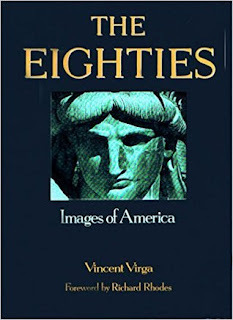 Vincent Virga's book is not, however, simply a collection of spectacular photographs of events and personalities. It is a narrative in pictures that gives the heart's view of our recent past. As Richard Rhodes says in his Foreward, "The images that follow are primary. They're irreducibly 'true.' What Virga does here corresponds to what historians do: he picks and chooses among the available evidence and arranges it so that it shows forth its meaning." I liked the 80’s, even though it was a time where people were preoccupied with money and possessions, celebrity obsession was all the rage, and conservatism was on the rise. My brother came out at the same time as the warnings about the new “gay cancer.” I took out a loan from the bank I worked at and bought my first new car, proving my dad wrong on two points – that women were incapable of buying a car on their own and couldn’t drive a manual transmission. I had to ask the guy who sold the car to me for a driving lesson, but managed to get the car home safely. Then I moved out of my parents’ house in 1980, ready to take on the world. 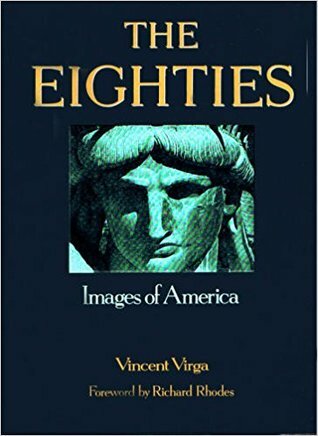 This was a fun, photographic journey through the 80’s. Politics, celebrities, sports, fashion, protests, strikes, and significant world events were covered. There was a poignant photo of the NAMES Project AIDS Memorial Quilt the same year President Reagan first mentioned the word. There was a photo of the Guardian Angels, patrollers of the graffiti-covered New York City subways, kids and teens playing Pac-Man and Galaxian at an arcade, and a photo showing effects the Valdez oil spill had on animals. Each year ended with obituaries. Though there was mention made of John Lennon’s murder in 1980, it must have been an oversight that he was not included in the 1980 obituaries along with Alfred Hitchcock, Steve McQueen, Jean-Paul Sartre, Mae West and others. Starting in 1981, there was a caption with the AIDS death toll (163). By 1989, that number reached 83,681. I would have liked more narrative details about certain events and the people I didn’t recognize. Other than that, I enjoyed the trip down memory lane. Sadly, two photos were ripped out of the 1985 section. People who deface library books should be publicly flogged.